Much of the original building was destroyed by fire in 1307 and restored during the fourteenth Century. The sixth High Steward, Walter, married Marjory Bruce, the daughter of the famous Scottish king Robert the Bruce (who had defeated an English army at the Battle of Bannockburn in 1314) in 1315. In the following year, Marjory died at the Abbey following a tragic riding accident nearby, but the baby in her womb was saved and he became King Robert II of Scotland, the first of the Stewart monarchs. For that reason, the Abbey claims to be the 'cradle of the Royal House of Stewart.' Our present Queen is descended from him. In fact, the Abbey is the final resting place of six High Stewards of Scotland, Princess Marjory Bruce, the wives of King Robert II and King Robert III for whose tomb, Queen Victoria provided a canopy in 1888 (shown above). The collapse of the central tower in the mid-16th century destroyed the transepts and choir and a wall was built across the east end of the nave. At the Scottish Reformation in 1560, the monastery was disbanded, the monastic buildings handed over to the Hamilton family and the walled-off nave became the parish church of Paisley. The transepts and choir were to remain in ruins until the late 19th and early 20th centuries when they were restored to create one of the finest churches in Scotland. 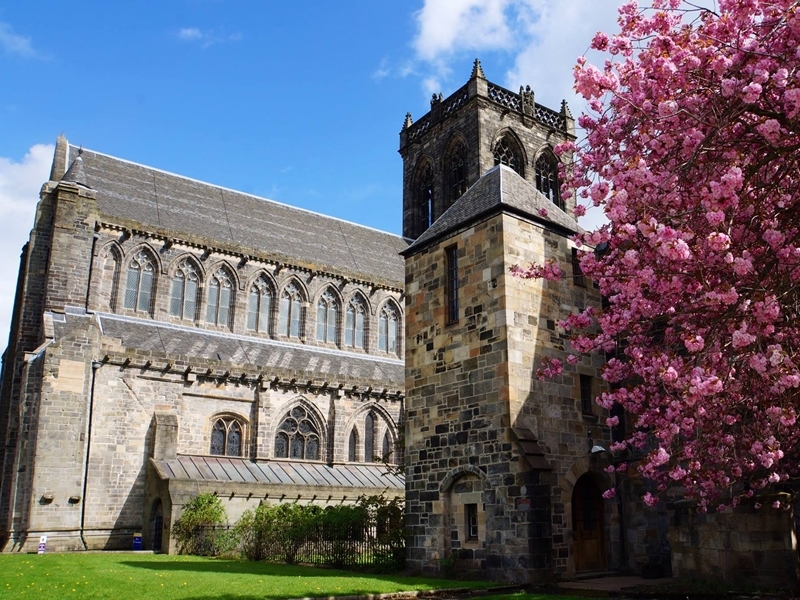 While we take every opportunity to ensure the details for Guided Tours of Paisley Abbey are accurate, we always advise that you contact the event organiser before setting out for the event to avoid disapointment.